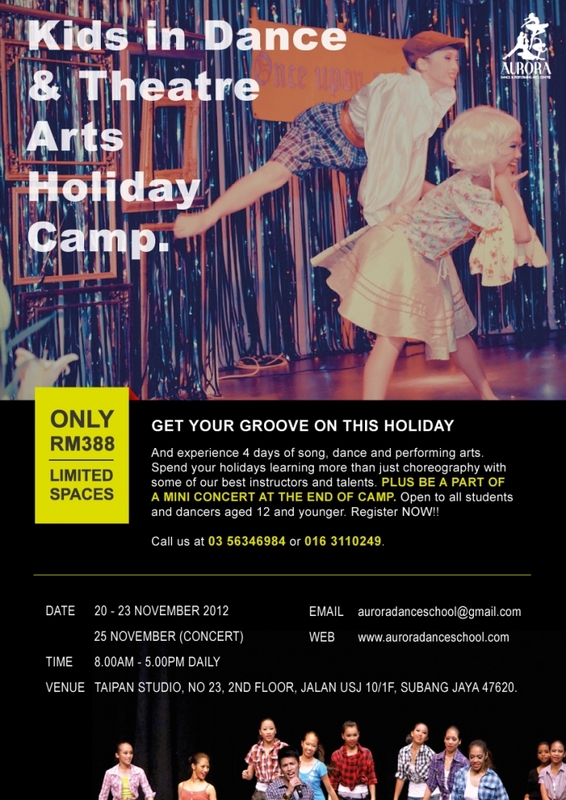 The Aurora holiday camps are here to stay. After a very successful 4 day dance and musical theatre workshop, teachers are already planning the next one to be bigger and better with more theatre arts in the curriculum. The 18 participants learnt 4 short hip hop routines, 2 old English dances, a Broadway reprise of Singing in the Rain, as well as sang and danced to a medley of Disney evergreens. They embellished their own costumes and brollies during their lunch breaks. The studio was abuzz with activities all day. Participants ages between 6 and 12 put up a little concert for their parents and friends. There was a photo session after the performance followed by a lucky draw and a tea party. The grand prize comprising a dance bag, a cookie hamper and a scholarship to attend next year’s camp was won by Si Jin. Click here to go to photo gallery!